Be the first to share your favorite memory, photo or story of Rev. Billy. This memorial page is dedicated for family, friends and future generations to celebrate the life of their loved one. Rev. 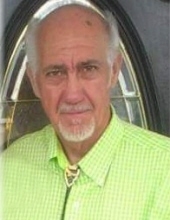 Billy Joe Lowe, age 66, of Wolf Creek River Road, Williamsburg, Kentucky departed this life on Wednesday, March 27, 2019 at the Jellico Medical Center Jellico, Tennessee. He was born on October 13, 1952 in Clairfield, Tennessee to the late Alvis and Nellie (Bray) Lowe. He was also preceded in death by two children, Randy Moses and Joe Moses and a brother, Richard Lowe. Billy Joe was the founder of Power Pack Ministries. He is survived by his wife, Geneva (Veach) Lowe of Williamsburg, Kentucky; three children, Rebecca Lowe and Billy Joe Lowe Jr. of Lafayette, Tennessee and Michael Moses of Williamsburg, Kentucky; eleven grandchildren; six great grandchildren; sister, Marty Caine (Bud) of Texas; two brothers, Raymond Lowe (Kathy) of Newcomb, Tennessee and Jimmy Lowe (Vonda) of Jellico, Tennessee; several nieces and nephews; and a host of other family and friends to mourn his passing. Visitation will be after 5:00 P.M. Sunday, March 31, 2019 at Power Pack Ministries. The Funeral Service will be at 1:00 P.M. Monday, April 1, 2019 at the Power Pack Ministries with Rev. Randy McHargue officiating. Following the Service he will be laid to rest in the Lowe Family Cemetery on Wolf Creek River Road in Williamsburg. To send flowers or a remembrance gift to the family of Rev. Billy Joe Lowe, please visit our Tribute Store. "Email Address" would like to share the life celebration of Rev. Billy Joe Lowe. Click on the "link" to go to share a favorite memory or leave a condolence message for the family.